Lil Wayne may have spent most of 2010 in prison, but he still found a way to do a good deed. The Grammy winner gifted a fan's mother with a brand new electric wheelchair while behind bars. In a video posted on his website, Wayne shared the story of Rhonda Austin, a longtime fan, who sent him more than a few letters of support and encouragement during his eight month bid on Rikers Island; a move that paid off in a way that she never expected. "One day I was driving down the expressway and my phone rang," Austin recalled of receiving a call from an unfamiliar number. "Something said just pick up it up. I'm like, 'Hello?' then he said, 'Hi, may I please speak to Ronda Austin,' I said 'Speaking. May I ask who's calling?' 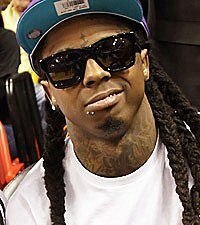 he said, 'Yes, this is Lil Wayne.' I said 'Oh, ok. Who?'" During her letter correspondence with Wayne, Austin explained that her mother was in need of a new wheelchair which was to be purchased by her father, but the 28-year-old vowed to foot the bill himself. "In the midst of our conversation he said, 'Did you and your dad get your mom a wheelchair yet?' and I said, 'No, we're still working on getting her a chair. He said ... 'Alright, don't worry about it.' I said, 'What do you mean?' He said, 'No, no, no, don't worry about ... I'm gonna take care of it." The video goes on to show Austin's mother, Evelyn, who had been confined to her New Jersey home for two years due to bad knees and an ill-fitted wheelchair, receive a her brand new ride. Not skimping on style, Weezy gifted Evelyn with the Quantum 6000, a top of the line highly maneuverable chair with advanced speed options. "I felt good, I felt really great," Evelyn said. "I didn't know Wayne before now, but I do know him now and I thank him. I really thank him to be so great and give me a chair. He didn't even know me and he got me a chair. I pray and ask God to bless him."